The Herd Groyne light sits at the end of its pier like a small alien spacecraft that has got lost, landed in South Shields and liked it so much that it decided to stay. 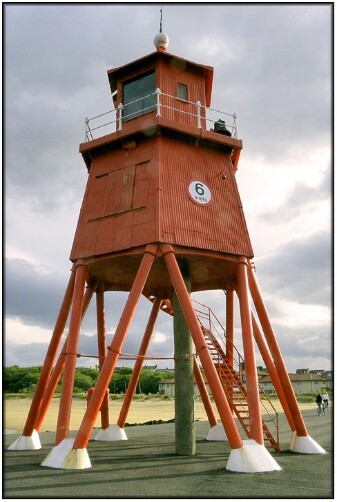 Whilst not exactly vanishingly rare, the design of this lighthouse is somewhat unusual in Britain, particularly this far north, and it certainly adds bags of visual interest to the southern approaches to the Port of Tyne. Access is no problem as the groyne is freely accessible to the general public. In the summer months there are river cruises from Newcastle that come downriver as far as Tynemouth and they also provide an excellent opportunity to photograph the light from the water. I've selected this particular shot to illustrate this light as it shows the lantern windows clearly. However, there is only a short area of pier between the light and the end of the groyne and this point and a fairly wide angle lens will be required.